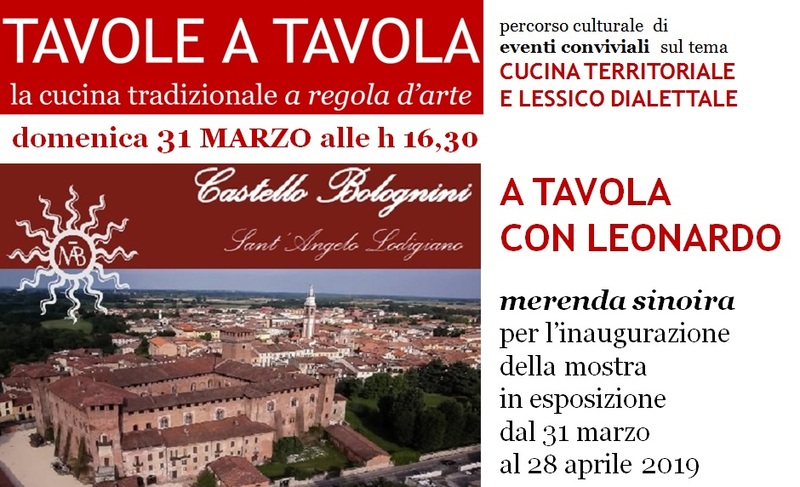 From sunday March 31st until sunday April 28th 2019 the TAVOLE A TAVOLA collection will be displayed at BOLOGNINI CASTLE, a national monument managed by the Bolognini Foundation, a historic Italian research center dedicated to innovation in the fields of agriculture that houses and preserves the manor and its muesums. The castle was built in the 14th century as a fortress, from Beatrice della Scala Visconti it was embellished for its use as her own summer residence, and from the fifteenth to the twentieth century was the house of the counts Bolognini Attendolo Sforza, whose progenitor Matteo Mazzagatti, known as Bolognino, was an innovator of agricultural systems. In the past, the Bolognini’s castle guested Giacomo Casanova and Leonardo da Vinci, who stayed here for studying the circulation of water in the Lambro river and designing canals, the circuit of the Navigli that once were then used to transport agricultural products to Milan and waterways which still now irrigate the fields in the areas included into the Duchy of Milan and Marquisate of Monferrato, today regions of Lombardy and Piedmont, the provinces of the cities of Alessandria, Lodi, Mantua, Milan, Pavia, Novara, Vercelli…, and the Po Valley, which the works of land reclamation and irrigation made become rural, and before it was a vast wild area of marshes, swamps, moors and woods. TAVOLE A TAVOLA exhibition will be displayed in the sale del presidio of Bolognini castle, accessible to the public on the opening days of the manors’s museums: the Morando Bolognini Museum of Art and Antiques, the Museum of the History of Agriculture and the Museum of the Bread. On Sunday March 31st in the frame of TAVOLE A TAVOLA exhibition at Bolognini castle will be held the usual refreshments that gladden the cultural events, for the occasion carried out as a traditional MERENDA SINOIRA. << Per favore non invitatemi a fare apericena, non ci verrò… Non è questione di dieta, è che io voglio fare solo MERENDA SINOIRA – Beppe Gandolfo, “Niente apericena, solo merenda sinoira“, IL PUNTO – Cos’è…?!?! Blasfemi e ignoranti… quando il tempo era ancora scandito dalle campane e nei campi si lavorava fino a quando faceva scuro, verso sera ci si fermava per uno spuntino e raccontarsi i fatti del giorno >>. At the MERENDA SINOIRA held at Castello Bolognini for the opening of TAVOLE A TAVOLA exhibition, the participants will share some wine and food specialties of the rural territories in the counties of the cities of Lodi in Lombardy region and of Alessandria in Piedmon region. Representing the territories of Piedmont there will be: pane grosso from Tortona produced with flour from the San Pastore Consortium, grissie bread and grissini bread-sticks from Monferrato, muletta and salame cotto made by Miglietta sausage factory, dairy products and eggs from Val Bormida of the Alessandria’s Milk Plant, pesti made with vegetables and hazelnut sweets of Mangè from Casale Monferrato. As a tribute to Leonardo da Vinci, the MERENDA SINOIRA at Bolognini castle will also present a wine and a cheese of which the “genius” had knowledge, and left testimony: malvasia and montébore, respectively of the Casalone winery from Lu Monferrato e the Vallenostra cheese factory from the Val Borbera. And, accompanying himself to the lute, Massimo Marchese will interpret the musical rebus composed by Leonardo da Vinci. TAVOLE A TAVOLA – LA CUCINA TRADIZIONALE A REGOLA D’ARTE presents on display the collection of drawings by the artist Cecilia Prete which illustrates the recipes collected by the gastronomic Luigi Bruni in the books of the PIATTI ALESSANDRINI series, published by VICOLO DEL PAVONE Editions of Castelnuovo Scrivia, and shows in consultation a copy of the ATLANTE STORICO ALESSANDRINO volume, published by the De Agostini Group for the CRA Foundation. In the 2019 edition, exhibition and convivial event TAVOLE A TAVOLA are carried out in the cultural journey on the theme CUCINA TERRITORIALE E LESSICO DIALETTALE – Territorial cuisine and dialectical lexicon included in the International Year of Indigenous Languages’ calendar. Spring events will take place on 30 March at Castello di Frassinello and 31 March at the Castello Bolognini di Sant’Angelo Lodigiano, where the initiative is organized by the Cultural Association Dire Fare Disegnare of Casale Monferrato in collaboration with Fondazione Bolognini and Vicolo del Pavone Edizioni, the Monferrato HospITALITY & Handmade and Contesti Turistici teams, Fondazione Enrico Eandi and the media-partner Tortona Oggi, Tutto sulle Galline e Viaggi fino alla fine del mondo, with contributions from Sanber – Casale Monferrato and Spalla Ortofrutticoli – Borgo San Martino and under the patronage of the Città di Sant’Angelo Lodigiano and of Provincia di Alessandria, Alexala and Confagricoltura Alessandria.